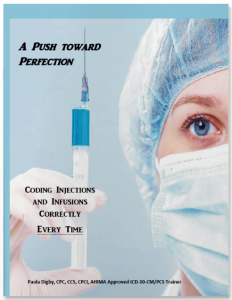 A Push Toward Perfection: Coding Injections and Infusions Correctly. Every Time. In this book, Paula Digby explains the various options for coding injections and infusion services (excluding chemotherapy). She details each option and describes in what circumstances it is appropriately selected. Correct documentation for each of these services is also detailed. In the end, Ms Digby provides case studies and an auditor’s perspective gleaned from years of auditing records in which these services were billed. A BONUS section in the back of the book contains AQ-IQ’s Injections and Infusions Tool for Emergency Department and Observation.